NEW YORK (March 21, 2018)— In a battle of two of the world’s pound-for-pound best, JORGE “El Niño de Oro” LINARES will defend his World Boxing Association (WBA) and Ring Magazine Lightweight titles against VASILIY “Hi-Tech” LOMACHENKO on Saturday, May 12, at “The World’s Most Famous Arena”, Madison Square Garden. 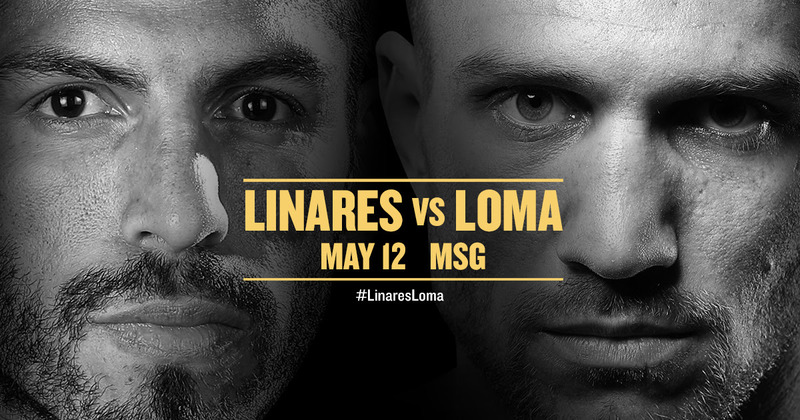 Linares vs. Lomachenko will be televised live and exclusively at 8:00 p.m. ET on ESPN and ESPN Deportes and stream live on the ESPN App at 6:30 p.m. ET. Promoted by Top Rank, in association with Golden Boy Promotions, Teiken Promotions, and Madison Square Garden, tickets will go on sale to the general public at 12 p.m. EST on Friday, March 23. Priced at $506, $406, $306, $206, $106, and $56, including facility fees, tickets can be purchased at the Madison Square Garden Box Office, all Ticketmaster outlets, Ticketmaster charge by phone (866-858-0008), and online at ticketmaster.com and MSG.com. Linares (44-3, 27 KOs), a 15-year pro from Barinas, Venezuela, is a three-weight world champion who is riding a 13-bout unbeaten streak dating back to 2012. He captured his first world title in 2007, when he scored a 10th-round stoppage over Oscar Larios to win the vacant WBC Featherweight crown. He defended that title once before moving up in weight, winning the vacant WBA Super Featherweight title on November 28, 2008, with a fifth-round TKO over Whyber Garcia. Three stoppage defeats from 2009-2012 halted Linares’ momentum, but he has since re-established his place among the sport’s very best. He is a boxing globetrotter, as he won the WBC Lightweight world title in 2014 against Javier Prieto in Japan, and defended it against Kevin Mitchell in England and Ivan Cano in Venezuela. After vacating the WBC Lightweight title due to injury, Linares snatched the WBA Lightweight title by traveling to enemy territory in Manchester, England, and earning a unanimous decision over Anthony Crolla on September 24, 2016. Six months later, he returned to Manchester and won a near-shutout decision over Crolla in their rematch. He last fought on January 27, scoring a wide unanimous decision win over Mercito Gesta at The Forum in Inglewood, Calif.
Lomachenko has already conquered the featherweight and super featherweight divisions as a professional. Now, the two-time Olympic gold medalist is ready to put the lightweight division on notice. From Bilhorod-Dnistrovskyi, Ukraine, Lomachenko has won seven consecutive fights by stoppage, including four consecutive corner stoppages. Last December, he forced fellow two-time Olympic gold medalist Guillermo Rigondeaux to bow out following the sixth round. After the fight, Lomachenko quipped that his new nickname should be ‘No Mas-chenko.’ The Rigondeaux fight capped a 2017 in which Lomachenko earned ‘Fighter of the Year’ honors from ESPN and the Boxing Writers Association of America (BWAA). He also scored TKO victories over Jason Sosa and Miguel Marriaga that year, forcing corner stoppages in fights he was dominating. The ‘No Mas-chenko’ legend began on November 26, 2016, when the previously unbeaten Nicholas Walters stayed on his stool following the seventh round. Lomachenko captured the World Boxing Organization (WBO) Super Featherweight title earlier that year with a one-punch, fifth-round knockout of Roman Martinez. Vasyl Lomachenko Ready For August 25 Return!